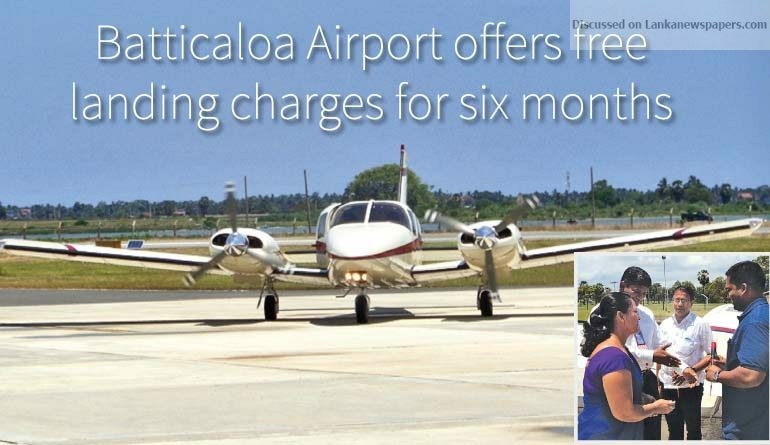 The newly opened Batticaloa Airport (Code : BTC) will offer free landing charges for a period of six months, said Minister of Transport and Civil Aviation, Nimal Siripala De Silva. The Minister said that by the end of the year an aviation school too would be built enabling youth in the region to enter the high paying aviation sector. Meanwhile the first civil flight “Fly Southern” to Batticaloa domestic airport arrived Tuesday (27) at 12.15 p.m. leaving Ratmalana at 11.15. The station Manager Batticaloa civil airport Cinthiga Fonseka said that this flight will operate between Ratmalana and Batticaloa on Tuesday, Friday and Sunday. The one way fare from Colombo to Batticaloa is US$ 100. Cinnamon Air is also operating scheduled flights to Batticaloa and a few more airlines including Sakura Air too are looking at adding Batticaloa to their radar.